others simply collapsed due to age and disrepair, and some were torn down to make way for newer iron bridges. 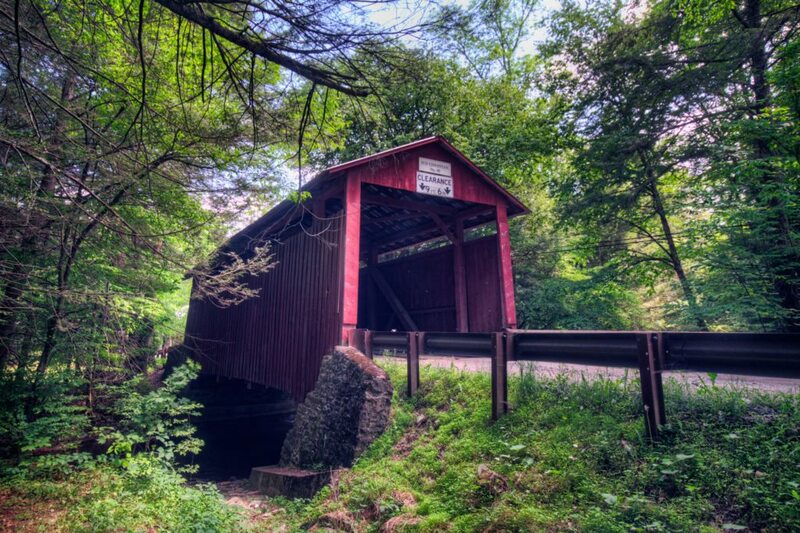 Pennsylvania is the state with the most covered bridges remaining in the country, with approximately 200 bridges. Columbia and Montour counties are home to the towns of Benton, Berwick, Bloomsburg, and Danville – not to mention 25 of the state’s total covered bridges. This places the counties as having the third highest number of bridges in the entire United States, only behind Parke County, Indiana and Lancaster County, Pennsylvania! No two covered bridges are alike and each one has its own history, personality, and story to tell. Columbia County alone has 19 bridges, Montour County has two covered bridges, and four additional bridges span the divide between Columbia & Northumberland counties. Many reasons are suggested for covering bridges. One generally accepted reason is protection from weather and wood rot in order to make sure the bridges lasted longer. Sides and roofs protected the beams and timbers that served as key bridge supports. Less exposure to adverse weather conditions meant the bridges would hold up much better year after year. The covered bridges resembled barns so animals would be calm when passing through them. Having covers kept snow off the bridges and made for less maintenance in the winter months after the invention of automobiles. The bridge trusses were unsightly to many travelers, so adding sides and roofs created a much more aesthetically pleasing structure. To provide a place of shelter for travelers during storms. From an engineer’s viewpoint, adding a roof to a bridge added stability and strengthened the entire structure. 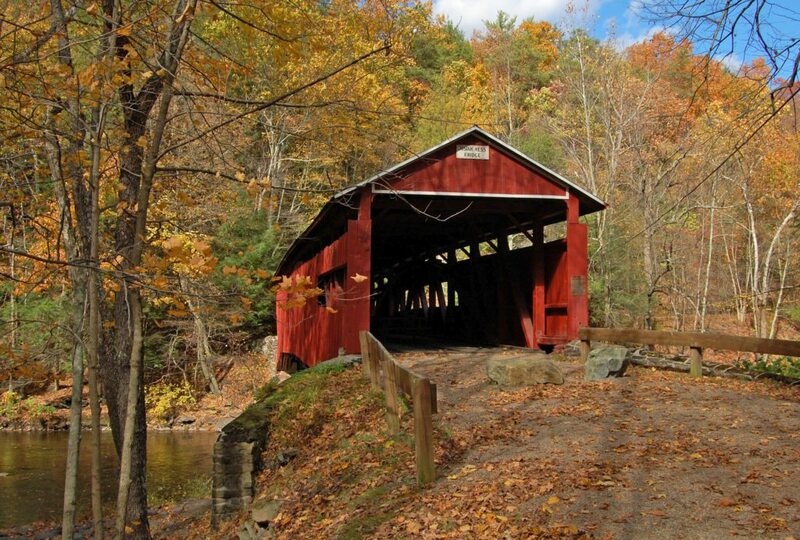 A more romantic utilization of covered bridges was as a location for courting couples to meet. Covered bridges are also known as “kissing bridges” for that very reason! Despite roofs and sides playing an important role in preserving key support beams, the earliest winters with covered bridges brought another challenge. In the latter part of the nineteenth century and the early twentieth century, workers would be paid to shovel snow onto bridge floors to enable winter horse and sleigh traffic. If the rest of the roads in the area were snow-covered, travelers would have utilized a horse-drawn sleigh in lieu of the traditional carriage to get around. Without snow covering the floorboards of the bridges, crossing them in a sleigh would otherwise have been extremely difficult. A past resident of the area, Donald L. Diseroad, recalled his father using a rented horse and sleigh in the early 1900’s to complete his rural mail route when the roads were snow covered. He also noted that in the late 1800’s, his grandfather John Diseroad worked odd jobs throughout the year. One of his odd jobs in the winter was shoveling snow down on the bridge floors. Planning to Visit the Bridges? 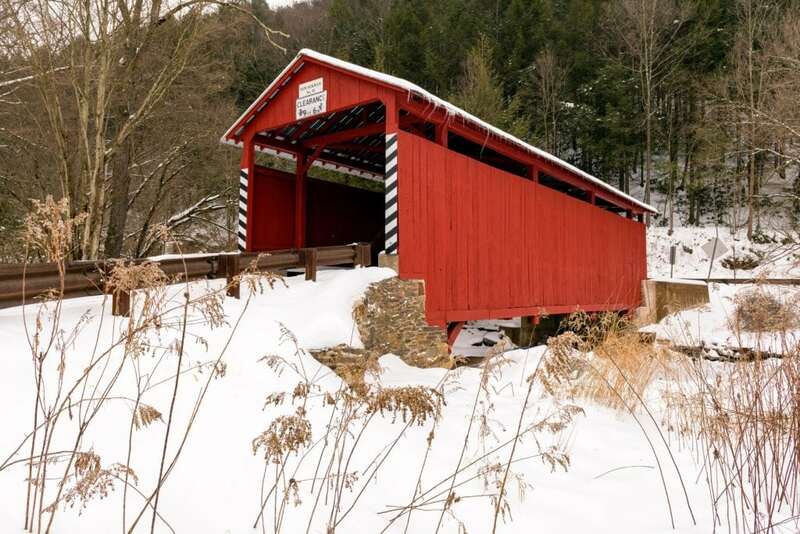 If you are planning to visit our iconic covered bridges, your first step would be to obtain our free Covered Bridges of Columbia and Montour Counties brochure and driving map. This comprehensive publication includes all 25 area covered bridges, including a detailed driving map and turn-by- turn directions. The brochure will take you on a historical and educational journey along our scenic back roads to visit the beloved bridges. To get your free copy, visit our “Request a Brochure” page or by stopping in to the Visitors Bureau Welcome Center (121 Papermill Road, Bloomsburg). You can elect to complete the entire driving tour or just go out and visit a few of the bridges. Venture out at your own pace and enjoy the beauty of the surrounding landscape and covered bridges! At the same time, plan to make a weekend out of your visit. There are plenty of wonderful things to see in do in the rest of the county, including stunning fall foliage, State Parks, hiking, biking, river and lake sports, historical walking tours of the area towns, and much more. Often, there are also special events and festivals happening every weekend throughout the region. For more information, please contact the Columbia Montour Visitors Bureau at 570-784-8279 or head over to our “Request a Brochure” page to get more information. We hope to see you soon! Become a Covered Bridge Enthusiast! Learn more about our historic covered bridges, and the various events, puzzle releases, photo contests, and more that happen throughout the year! Can’t get enough of our covered bridges? Each year, the Visitors Bureau holds a photo contest to produce a 500-piece puzzle featuring one of the area covered bridges. Limited-edition puzzles have been produced the past six years and have featured the East & West Paden bridges (2 times), the Knoebels Bridge, Keefer Mills Bridge, Esther Furnace Bridge, Stillwater Bridge, the Josiah Hess Bridge, and most recently, the Rupert Bridge. The 2018 edition of the puzzle was released in September and featured the Rupert Bridge for the first time. All 2018 puzzles have been sold out – the 2019 puzzles will become available after the winning photo is selected from the photo contest! 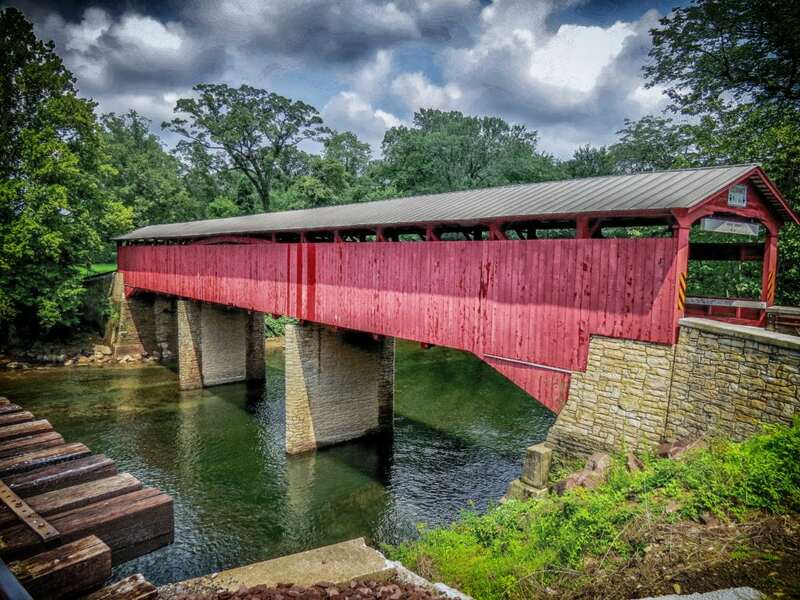 The Visitors Bureau’s 2019 Covered Bridge Photo Contest is accepting submissions from March 1 – June 1, 2019. Email your photos to skiefer@cmvb.com within the dates above. MUST INCLUDE: Photographer’s name and the name of the covered bridge. OR post your photo on Instagram using #CMVBPuzzle2019. MUST INCLUDE: Photographer’s name and the name of the covered bridge. If selected as a finalist, you will be contacted for a high quality version of your Instagram submission. All photos must be of bridges located within Columbia or Montour County. All photos must be owned by the person submitting them. By submitting, you are giving the Columbia-Montour Visitors Bureau permission to use your photo as their 2019 puzzle and in future marketing efforts. All photos must be high-resolution (at least 1000 pixels on either side). A max of five photos per person will be accepted. 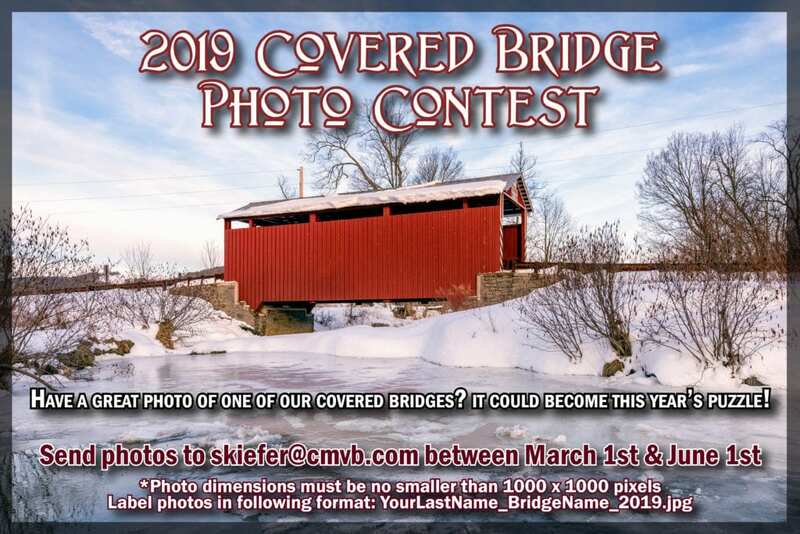 One lucky entrant will be chosen by staff of the Columbia-Montour Visitors Bureau to have their photo featured as our 2019 Covered Bridge Puzzle. The puzzle is released in September and sold at the Bloomsburg Fair, the Covered Bridge & Arts Festival, and at the CMVB Welcome Center. The winning photographer will have their name and a short bio published on the puzzle box. The winner will also receive a free puzzle and will be announced to local press outlets. $2 from each sale is donated to the Columbia County Covered Bridge Association. Each puzzle is a limited edition item, and can be kept as collector’s items. Only 250 puzzles are produced each year. The Visitors Bureau is pleased to announce the 2018 Covered Bridge Photo Contest winners. The overall winning image is featured as the 2018 Covered Bridge Puzzle. 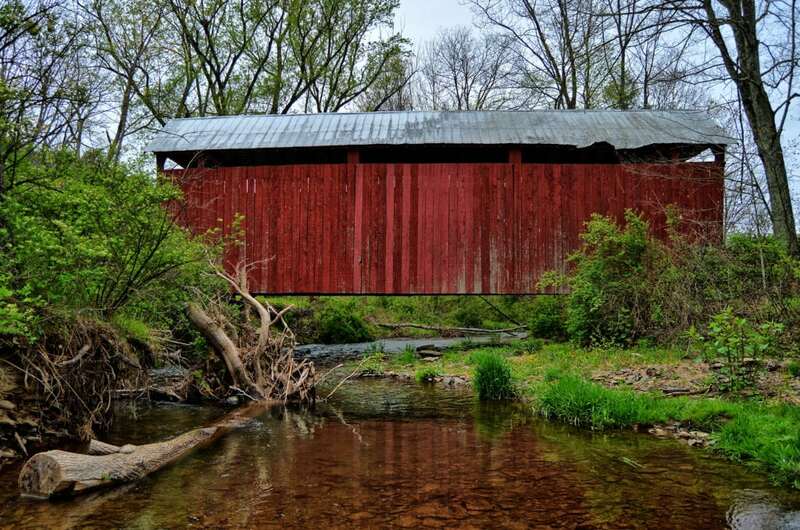 Anthony “Tony” Berard Jr.’s snapshot of the Rupert Bridge in Columbia County was selected as the overall winner. Tony taught mathematics at King’s College for forty years. During breaks from teaching, he experimented with travel photography. Upon his retirement in 2012, he had more time to pursue photography as a serious hobby, and he joined the Hazleton Camera Club. Tony and his wife live in Conyngham and enjoy visiting and photographing the historic covered bridges of Columbia and Montour counties. Several other photographers were recognized in this year’s contest: Margie Hunsinger submitted the 5th place photograph of the Paar’s Mill Bridge, Anthony Berard Jr. was also awarded 4th place for his photo of the Kramer Bridge, Bob Erlsten was awarded 3rd place for his image of the Sam Eckman Bridge, and Brandy Whitenight placed overall runner-up with her photo of the Johnson Bridge. The Visitors Bureau would like to thank everyone who submitted photos for the contest, as there was a contest-record of 62 submitted photos this year. A donation of $2 from every puzzle sold is made by the Bureau to the Columbia County Covered Bridge Association to go toward restoration and preservation of our local covered bridge treasures. The Columbia County Covered Bridge Association restores, preserves, and advocates for the covered bridges of Columbia County for historical and recreational purposes. Their purpose is simple: they recognized the historic importance of the covered bridges as a public treasure to be available to and enjoyed by the public and the important part they play in tourism. This non-profit association protects all of our covered bridges not only for today, but also for future generations. Come join our bus tours of the bridges! The Visitors Bureau offers a bus tour each spring and several bus tours in the fall (associated with the Covered Bridge & Arts Festival). 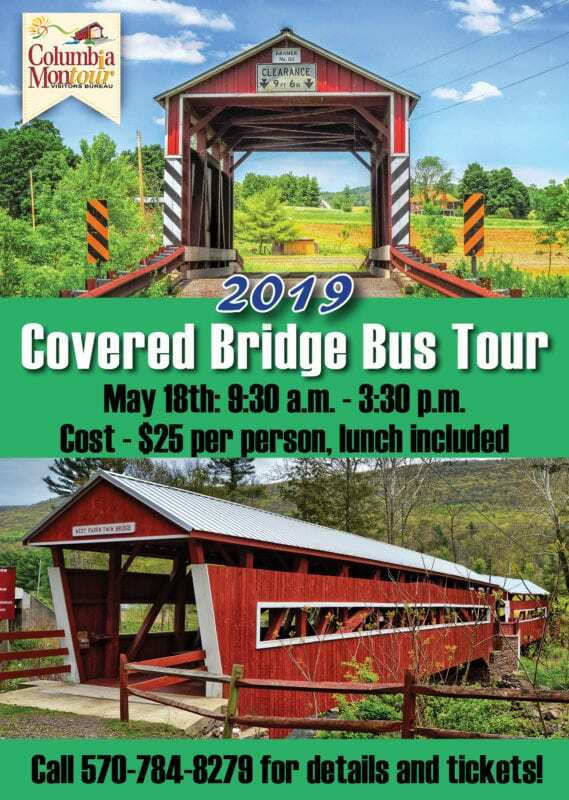 Spring Covered Bridge Bus Tour – May 18th, 2019; 9 AM – 3:30 PM. $25 per person. Have you longed to see many of the nineteenth-century covered bridges Columbia County has to offer, but didn’t want to travel off the beaten path alone? 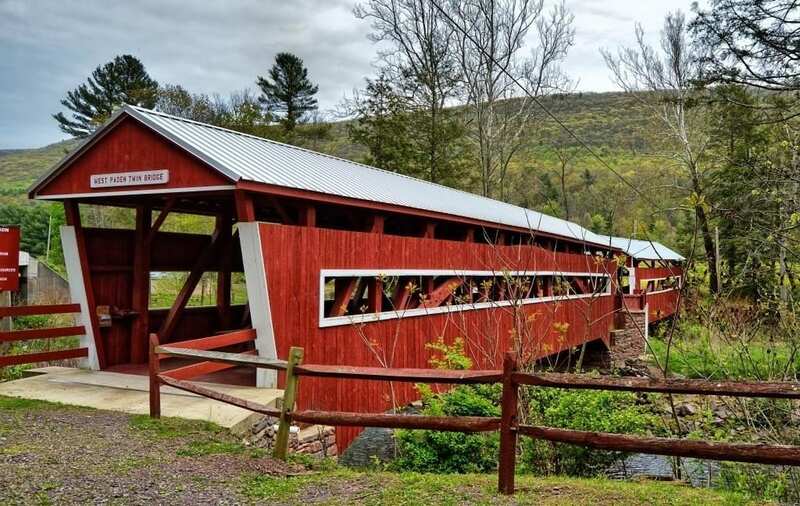 If you are looking for a delightful and informative day touring our historic covered bridges, please join the Columbia-Montour Visitors Bureau for its sixth annual Covered Bridge Bus Tour on May 18th, 2019. Hop on the bus at the Visitors Bureau office at 121 Papermill Road in Bloomsburg to begin a historical adventure. Guests can unwind as the guided ride meanders through the picturesque Central Pennsylvania countryside to visit 13 of the area’s covered bridges. Symbols of small-town America, these covered bridges coax travelers off the beaten path to explore little streams and forgotten dirt roads. At each stop, there will be opportunities for leisurely exploration and for taking photographs. Enjoy a picnic lunch provided by the Visitors Bureau at one of the only two twin covered bridges in the United States. Reserve seats on the 2019 bus tour by calling the Visitors Bureau Welcome Center at 570-784-8279! CHECK BACK IN 2019 FOR DATES! 2018 Info: This year’s Fall Bus Tours will be held on Friday, October 5th at 10 AM and and also on Sunday, October 7th at 11 AM and 12:30 PM. Tickets are $20 each. The tour lasts about 2.5-3 hours with stops at 4 bridges: Esther Furnace, Rupert, East & West Paden Twin Bridges, and Stillwater. The tour will pass at least 4 additional bridges, but there will not be time allotted to stop and get off the bus at the additional bridges. The bus is NOT handicapped accessible, and riders will need to be able to get up the three steps of the bus without assistance. There will be step-on guides on each bus to provide further information about the bridges and a general history of the area. Tickets will not be mailed in advance, and will need picked up at Pavilion H at Knoebels at least 30 minutes prior to departure. Any tickets not picked up 10 minutes prior to departure will be resold to those waiting in line. Pavilion H is located right off of the parking lot as you enter the Covered Bridge Festival. There will be a large information sign on the front of the pavilion. REMEMBER, allow for plenty of time to get into the park. Saturday traffic can be backed up for 2-3 hours to get into the parking lot. NO cancellations after September 12th. No exceptions. Reservations are first come, first served, and spots are limited. Call 570-784-8279 for more information or to reserve your spot.